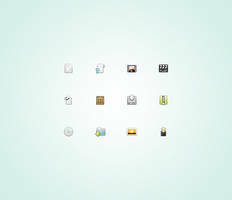 A pack of 218 32px icons I've used in or created for my projects. Available in png, ico, icns, pasted icons and iContainer. 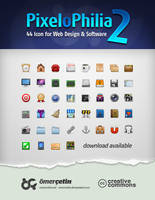 This packs also has 26 bonus 48px icons and 6 badges. The badges are available in png only. The 48px icons are not be included in the icontainer. 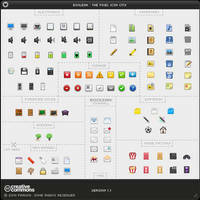 These icons are licensed under a Creative Commons Attribution 3.0 license. For more info and suggested attribution format, read the included license document. For a list of changes in the latest updates, read the changelog document. Finally! 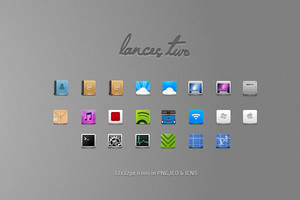 A large collection with really good looking icons. It was hard to find something like this, Google wasn't too friendly today. 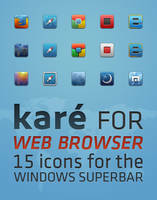 Impressive icons..I like it..This is really useful some of my projects..Thanks! I am working as a designer. Your icons are very useful. Thank you. I am currently studying your work..Looks so amazing! Good stuff. 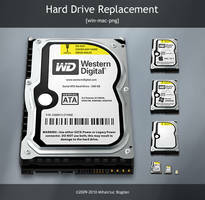 These would look good with a Linux distro. ms bogdan .sa ne traiesti . These icons are so beautiful. Thank you so much for them! 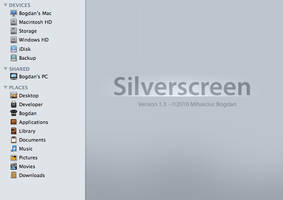 Do you work with the provided 48px resolution, or do you have them bigger, too? The 48px sizes were a one-time release. 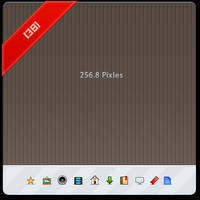 However I'm currently working on enlarging each of the icons to 64px. You can find some of them here. Particularly looking forward to bigger versions of the suit, the post sign, shild & swords. I could need them for a Android app I am currently developing. Well, target resolution should be 96x96 pixels, but 64 is a good start and scales much better. 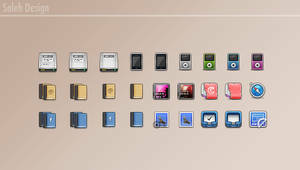 The best iconset i have encountered. Thanks for this set , i have been using them over an year on my forum www.myskins.org , thanks a lot. Bogo, honestly I love your work!!! Thanks for sharing!! 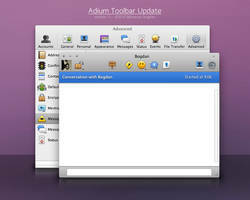 Actually I like this list better than the other one, can I ude these icons on my website? Obviously, you and your website will have all the credit for creating the icons! Yes, as these are licensed under creative commons, you can use them for any project you want, as long as you give credit somewhere in the project. Let me know what you think, and of course, you're welcome to share your art with the noosfeer community. Again, thanks for your awesome job! 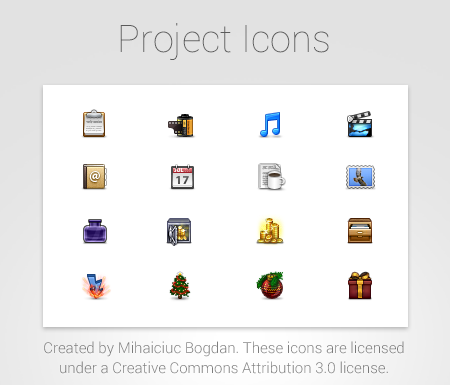 Awesome icons Mihaiciuc!! Thank you so much, i've been looking for a COMPLETE set of project management icons, and i've finally found it. Great work, thanks again. I've started working on a double resolution versions for a while now, but since I haven't had that much free time, it's been progressing slowly. They'll come eventually, but I can't give any ETA right now. I have another suggestion : why not making these icons resolution independent with svg ? This will ensure the icons don't get blurry when zooming on high res devices like the iPhone and iPad. Great work btw, I'm planning to implement some of these icons to one of my projects but I need them to be at a higher resolution (even the bonus 48px), svg would be perfect. 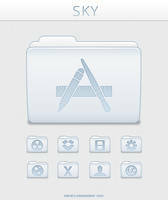 I mean are you planning to design a retina version of your icons ? Very stylish, I like them very much! Can i use these icons for my website? 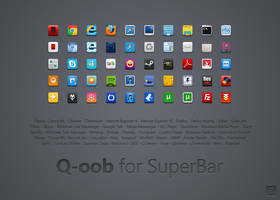 Nice collection of icons, man!! 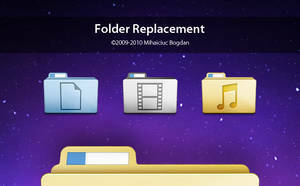 How do you apply the icons?